Irving Dale Fryar was born September 28, 1962 in Mt. Holly to Dave and Allene Fryar. A tremendous all-around athlete, Irving played football for Rancocas Valley Regional High, the alma mater of NFL star Franco Harris. He was a swift and sure-handed running back and receiver for the Red Devils and was recruited by several major colleges, including Nebraska, where he ended up accepting a scholarship. He was timed at 4.4 in the 40, had a vertical leap of 37 inches, and could bench press over 300 pounds. Playing beside former high-school rival Mike Rozier, Irving was a member of the powerhouse Cornhuskers squads of the early 1980s. Irving worked beautifully with quarterback Turner Gill, despite the fact Nebraska ran primarily a ground attack. He was also a valuable return man. As a senior in 1983, Irving caught 40 passes for 780 yards and 5 touchdowns. He was a First-Team All-American and First-Team All Big 8. At 6'0" and 200 pounds, he was big enough to continue his success in the NFL, and figured to be a high draft choice. Many were surprised when he was selected #1, by the New England Patriots. No wide receiver had ever been the first overall pick in the draft. Irving served primarily as a punt returner as a rookie in 1984. He would continue in that role for most of the next six seasons. In 1985, he led the NFL with a 14.1-yard punt return average and was named to his first of five Pro Bowls. Irving also cracked the Pats’ starting lineup as a receiver and caught 39 passes for 670 yards and 7 touchdowns. The New England offense was based on the running game, with Tony Collins and Craig James leading the way. Irving and Stanley Morgan gave the team two above-average wideouts. Their speed and pass-catching ability kept enemy defenses honest, and helped New England win the AFC Championship. Irving caught a touchdown pass in the Super Bowl—the Patriots’ only TD in a 46–10 loss to the Chicago Bears. 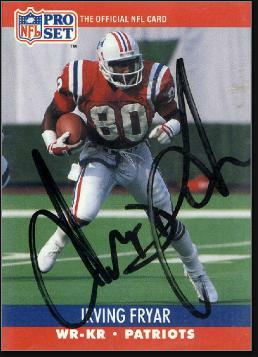 After nine seasons with the Patriots, Irving signed a free agent deal with the Miami Dolphins in 1993. Working with Dan Marino, he caught 199 passes in three seasons and was a Pro Bowl pick twice. On Opening Day in 1994, Irving amassed 211 receiving yards in the second half during a game against the Patriots. It was the second-highest total in a half behind Steve Largent’s 241, but Largent’s record came against replacement players in a 1987 game. Irving signed with the Eagles in 1996 and in his mid-30s enjoyed his two greatest years. He caught 88 passes for 1,195 yards and 11 touchdowns in 1996, and had 86 catches for 1,316 yards in 1997. In a 1996 meeting with his old team, the Dolphins, Irving became the oldest player to catch four scoring passes in one game. Irving played his 17th and final season in 2000 with the Washington Redskins. He caught 41 passes as a part-time player to finish his career with 851. He scored 80 NFL touchdowns as a receiver, one as a runner, and three as a punt returner. Irving caught touchdown passes from 19 different quarterbacks during his career—a pro record—and his 255 games played are the most ever by an NFL player from New Jersey. Irving retired to Jobstown, and settled into life as a pastor with the New Jerusalem House of God. He also coached football at Robbinsville High. Irving taught Philosophy and Sports Management classes at Union County College in Cranford. He watched his son, London, become a high school star as a defensive back. London later attended Western Michigan but failed to stick in tryouts with the Chiefs and Giants. Despite his hard work, Irving's post-football finances did not keep up with his expenses. He and his mother were accused of taking out multiple mortgages on the same property. They claimed they had been conned by a financial advisor, but in 2015 he was found guilty and sentenced to five years in prison for fraud and conspiracy. However, after eight months he was released into an intensive supervision program that enabled him to live at home and make payments on the $615,000 he was ordered to pay back by the court.